1. Added Repeater mode and AP mode. 2. Added the QR Code of the Tether APP in the web page. 3. Enhanced the compatibility of L2TP/PPTP dial-up. 4. Fixed some problems of PPPoE dial-up. 5. Fixed the bug that the device will transmit specific 'Membership Query Message' to the LAN, and enhanced the security of the device. 6. Fixed the bug that IE11 broswer cannot log in the web page normally after modify the LAN IP of the device. 7. Fixed the bug that cannot restore the previously saved configuration bin file in some special situation. 8. Enhanced the stability of the IPTV function. 1. Your device’s configuration will be lost after upgrading, which means you need configure your device again after upgrading. 2.It is NOT suggested to upgrade firmware which is not from your local TP-Link official website. 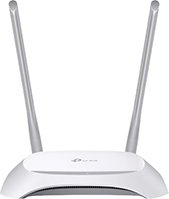 Please click here to choose the purchase location for your TP-Link device and download the most suitable firmware version.